What should you do if your vehicle breaks down on a motorway? Select all that apply. What should you do if your vehicle breaks down on a motorway? Select all that apply. Correct. If your vehicle breaks down on a motorway you should open your boot and bonnet, and hang something white on your car door handle if possible to indicate you need help. Call for assistance, put on your hazard warning lights, and keep well away from the motorway. If your vehicle breaks down while you are in the overtaking lane, try to coast to the hard shoulder on the left. Parking on the right-hand side of the motorway is the most dangerous place. Sometimes you can be forewarned of engine failure, particularly on a motorbike where you are closer to the engine. You might notice a change in tone of the engine or that it seems down on power. Warning lights might start to appear on the dashboard, for example this check engine light in yellow or (worse) red. You might also notice steam rising from the bonnet, metallic noises coming from the engine or transmission, difficulty changing gear, or the acceleration is no longer smooth. It might not be the engine that's the problem: if you have brake failure you will need to stop, too, as well as if your windscreen is smashed, you have one or more flat tyres or you run out of fuel. If you run out of fuel on somewhere like the Harbour Bridge in Auckland, where there are no hard shoulders and your vehicle will cause a significant disruption, police might fine you. Keep your vehicle serviced regularly to help minimise the risk of breakdowns, and always put more fuel in as soon as the fuel warning light comes on. You can either use your cellphone or an emergency phone to call for help. An emergency phone will give emergency services the exact location as each phone has a number. If you call from a cellphone you might be more vague about your position. 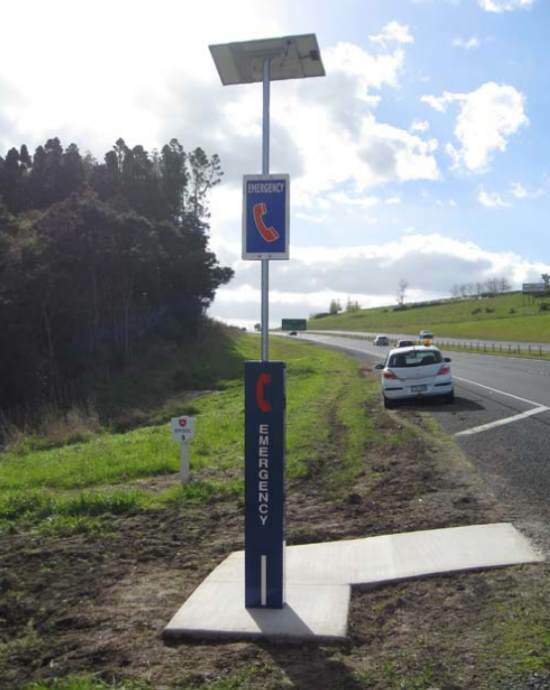 Emergency phones are located every 700-1200m on the motorway. Occasionally they will be closer than that if you are approaching a motorway on-ramp or off-ramp, so that you don't have to cross it. They are installed in pairs opposite one another so that a person needing one doesn't need to cross the carriageway. They are dark blue with a red reflective phone icon, and alpha-numeric white reflective stickers giving the ID of the phone. The phones are often located behind barriers to give you protection, but you should always make the call facing traffic. Phones are never placed where there is no hard shoulder, or if the hard shoulder narrows to less than 2.5m wide. The phone microphone is 1400mm from ground level and there's one button to press that's 1200mm from the ground - you can't go wrong.